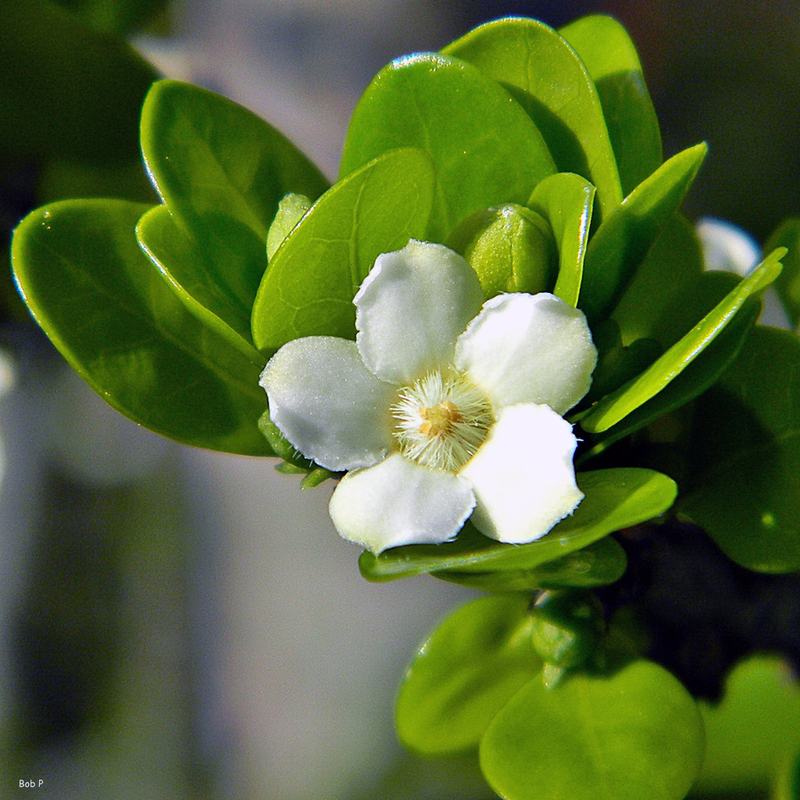 White indigoberry is an evergreen flowering shrub or small tree found in pine rocklands and coastal strands and hammocks in Central and South Florida. Its fragrant flowers bloom year-round, attracting a variety of butterflies, including Schaus’ swallowtail (Papilio aristodemus). Its pulpy fruit provides food for many birds. The plant is the larval host plant for the Tantalus sphinx moth (Aellopus tantalus). White indigoberry flowers are small, white and five-lobed. They are borne in the leaf axils. Leaves are orbicular with shiny upper surfaces and entire margins. They are oppositely arranged, often in terminal clusters. The plant’s trunk and branches may be armed with thorns. Fruits begin as green, marble-sized berries. At maturity, they turn creamy white with dark, bluish-black pulp (hence the plant’s common name). The pulp has been used to make a blue dye. The genus name Randia is an homage to English botanist Isaac Rand (1674–1743). The species epithet aculeate is from the Latin acutus, meaning “sharp” or “pointy,” and refers to the thorny branches. To see where natural populations of White indigoberry have been vouchered, visit florida.plantatlas.usf.edu. Garden tips: White indigoberry is suitable for border, buffer and hedge plantings. It also makes a nice specimen plant. Its evergreen leaves, stiff branches and year-round blooms provide color and interest in the landscape. The plant is drought-tolerant and does well in nutrient-poor soils. White indigoberry plants are often available at nurseries that specialize in native plants. Visit PlantRealFlorida.org to find a native nursery on your area.